Back in the fall, when Our Nature Zone was only a dream, i was desperate to have a place to post my fotos & observations to. Turns out the blog has been deleted, because i didn*t keep using it!! i am VERY GRATEFUL to BBE for saving my blog to her hard drive!!! So now, as time will permit, i will attempt to copy over my blog to this thread, so we can see what happened in the nest tree neighbourhood before Our Nature Zone was created! All fotos will be clickable. Click foto, then click again to see it up close. i was biking down Sheila & Doug*s road last evening with Dooki. We passed the for sale sign for a blue roofed house, but not THE blue roofed house. There was an owl sitting on the sign in broad daylight! At first i was, like, oh yeah, there*s an owl decoy to scare away robins or whatever. Then i went, wait a minute, that decoy*s eyes & head just moved to follow me! i almost never see owls. Sometimes i hear them in the dark at night, from my pillow. Once a pygmy owl hit my window & when i went out to rescue it it flew away to my clothesline. Anyway, this owl was about ten feet away from me! & not moving except to look at me! i was right near Sheila & Doug*s, so i ran over to get them & they came & looked too. Sheila went & got her camera & the owl just sat there while she & Doug took fotos. Then the owl flew to the peak of the house doorway. Should i run home & get my camera? Doug said i should, & that he*d take Dooki while i biked home. So i raced off, watching the beautiful sunset light disappearing. Would the owl wait for me to return & setup my camera? We were figuring this was a Barred Owl. But when i looked them up in my bird book, they don*t have the head tufts that this one did. So i*m thinking this was a Great Horned Owl. i*ve never seen one before, nor been so close to one. Is it normal for one to just sit there in the daytime like that? They seemed to fly okay. Sheila said she was picking raspberries, up & down a ladder, & suddenly she looked & there was this owl not feet away!! just sitting there having a visit with her. Sheila e-mailed me to say the owner of the blue roof house came by today, saying there was an owl in his garden. Sheila went off with her camera. The owl was on the fencepost of the garden of the blue roof house. Doug got a nice close up foto. Later, about 6pm when i biked by, the owl was sitting, practically on the ground! in the garden of the blue roof house, on the two by fours of the raised bed in the garden. They watched me bike by. Booni, Can't wait to see and read more of your posts here! 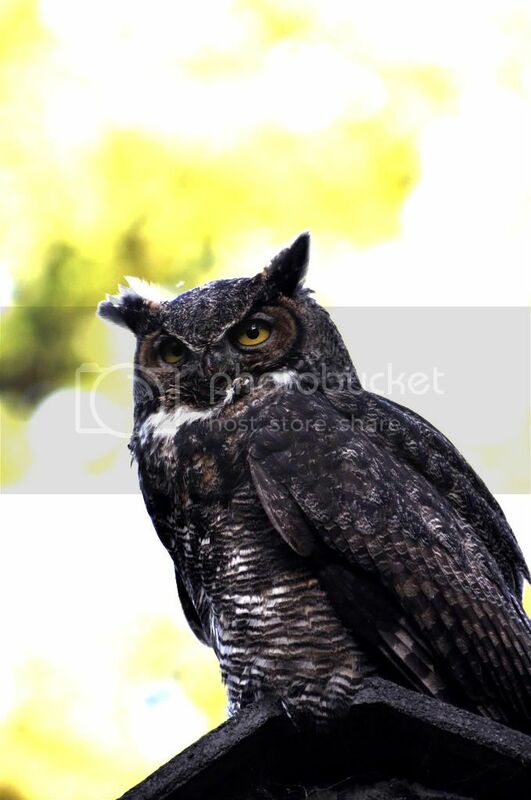 That's a nice picture of a Great Horned Owl. Is that the one you saw or an example of another owl? I'm not clear. I think that Ajl said it is the species that can harm bald eagles because that owl is bigger. We can ask her to see if that is what she said. I have seen a Barred Owl in a tree during the daytime at my brother's pond in WA State. They are good-sized, too, but smaller than a Great Horned Owl. Tiger, that is a foto of the owl i saw, a Great Horned Owl. Thanks, Booni. We'll be interested in reading about it when you have enough time. The Great Horned Owl is diurnal, meaning, for those who may not know, it is visible both day and night. This link is to a very imformative webpage on the species. They are intriguing creatures. I frequently have seen them here on Long Island. It's a biiiig bird and can be quite aggressive too. It has also been called "the night eagle"! That is a beautiful picture of the owl, and I enjoyed the story as well. I can't wait for your next posts. Booni, there have been many stories of large owls letting people approach them... They don't seem to be very afraid of humans. Here's my very favourite story. About 10 years ago, maybe a little more, there was a young Great Horned owl that was hanging out on the Ford Cove trail, not far from the ferry. I saw it from pretty close, maybe 20 feet! and so did many people. People kept wondering if it was injured, but it wasn't. One day my oldest daughter, then still in high school, went for a bike ride on the Ford Cove trail, as she often did. So when she got back I asked her if she had seen the owl. Her face filled with light and she gave me a smile I'll never forget, as she whispered... "I touched it!" She had spotted the owl sitting on a low branch, looking elsewhere... and had put down her bike and stalked, closer, closer... until with fingertips she touched a wing and the owl suddenly turned to her and hissed! "I decided that was enough." She said. Wonderful story, Wren! And the owl didn't do more than hiss?! That's amazing! Awww. "Her face filled with light and she gave me a smile I'll never forget"
"If I had influence with the good fairy who is supposed to preside over the christening of all children I should ask that her gift to each child in the world be a sense of wonder so indestructible that it would last throughout life, as an unfailing antidote against the boredom and disenchantments of later years, the sterile preoccupation with things artificial, the alienation from the sources of our strength." I re-read the story of last year's GHO near Doug's. When you can approach a bird like that, there is almost always a problem. It might not be wing-injured so can be flighted, but it could be weak, emaciated, suffering from secondary pesticides or rodenticides poisoning, might have head trauma or might be a youngster who became separated from parents and thus losing ground. RMB's daughter had such an owl in her yard last week. It was dead the following morning. Rule of thumb: if you can get close, err on the side of caution and contact rehab.